Figure 19-3: Separate bike and pedestrian paths line the banks of the Salzach River. Salzburg has earned worldwide recognition largely by keeping its Baroque historic center remarkably intact since the time of Wolfgang Amadeus Mozart, its most famous son. But the city’s natural setting is equally impressive due to preservation of the surrounding hills, the Salzach River and Mirabell Gardens, which together form a blue-green network around and through the Old Town, or Altstadt. 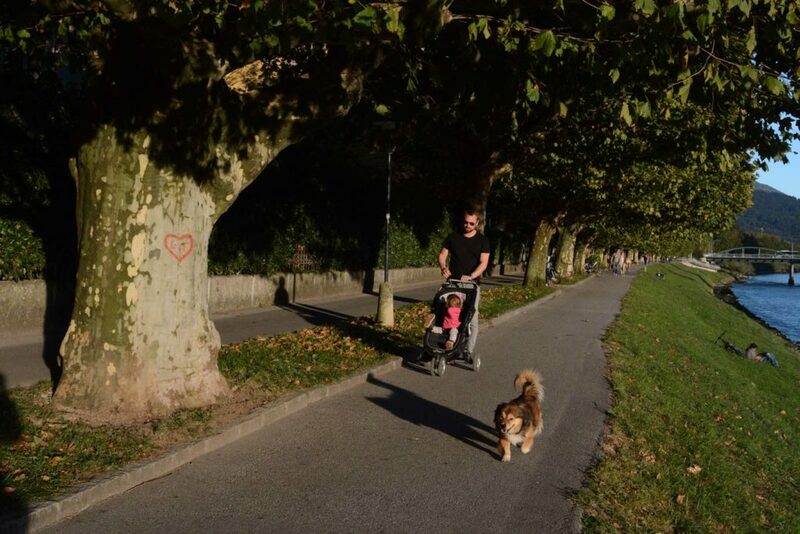 Salzburg strictly limits car access in this area and encourages alternative transportation using a pathway system that makes walking and bicycling pleasurable as well as the most efficient modes of travel. In 1996, UNESCO inscribed the historic Salzburg center as a World Heritage Site for its wealth of architectural gems, including Gothic buildings dating from the late-Middle Ages. But the UNESCO honor is also based in part on the integrity of the townscape and urban fabric (UNESCO, 2015a). This feeling of authenticity is arguably enhanced by the fact that Salzburg prohibits non-essential motor vehicles on more than five miles of pavement within the boundaries of the 236-hectare World Heritage Site, which incorporates Monchsberg Mountain, Kapuzinerberg Mountain, Mirabell Gardens and the Salzach River as well as Altstadt (UNESCO, 2015b). In the heart of Altstadt, Mozartplatz is a popular starting point for walking and bicycling itineraries. 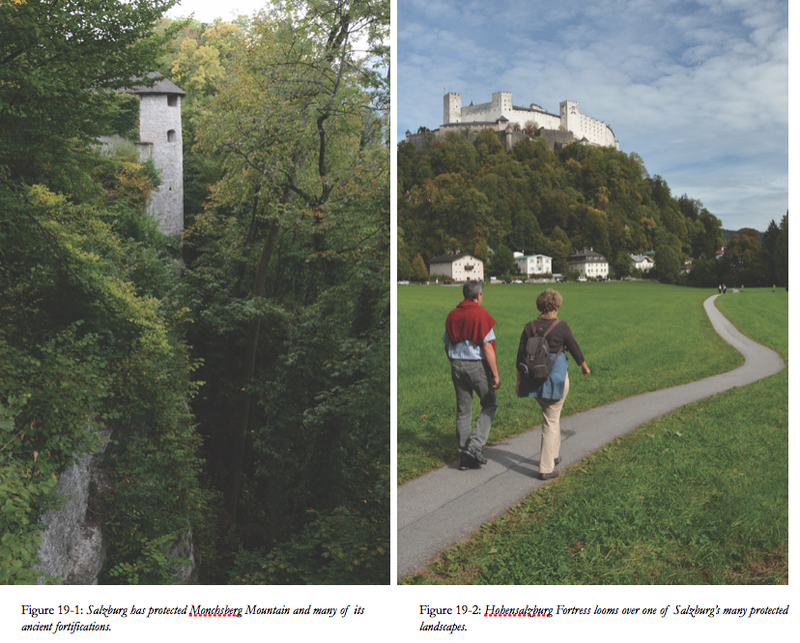 Heading west, hikers trek up the wooded paths of Monchsberg Mountain and contemplate the remnants of fortifications built in the 17th Century to defend Salzburg. Wandering north on Monchsberg, walkers arrive at Schloss Monchstein, a 14th-Century castle that has since morphed into a five-star hotel. The southward paths of Monchsberg lead to the Hohensalzburg Fortress, built in 1077 and today the largest, totally-preserved fortress in Central Europe (Salzburg, 2015). East of Altstadt, Kuputzinerberg Mountain offers habitat to deer, badgers, martens and chamois, a species of goat-antelope native to the European mountains. A footpath here passes religious dioramas from the 18th Century, a 16th-Century monastery and 17th-Century fortifications built to protect Salzburg during the 30-Years War. At the summit, hikers can revive at Das Franziskischlossl, a restaurant housed in a small castle built in 1529 (Franziskischloessl, 2015). Mirabell Gardens completes the greenbelt north of Altstadt. The gardens surround the Mirabell Palace, which houses the Marble Hall, formerly the prince-archbishop’s ballroom and a concert venue for the Mozart family. The gardens themselves date from 1690 and today form a green link between Kapuzinerberg Mountain and Monchsberg Mountain using the Mullner Steg footbridge over the Salzach River. The tree-lined riverbanks add a linear greenway to central Salzburg with bicycle/foot paths that traverse the entire UNESCO site. The bikeways here are part of Salzburg’s 170-km cycle path network. In turn, these bikeways connect with regional bike routes like the 450-km Mozart Bike Path, which starts in Mozartplatz and meanders for 450-km through the lake district of Salzburg and Bavaria (Salzburg, 2015). While preserving the Altstadt, Salzburg has been redeveloping some of its declining neighborhoods using advanced conservation and alternative energy concepts. In the Lehen district, the demolition of a soccer stadium triggered the transformation of an area of abandoned stores and neglected buildings. As one of 58 pilot projects cities in the European Union’s CONCERTO program, Salzburg and its partners reduced energy demand by 70 percent through the refurbishment of 12 existing structures. In the 13 new buildings constructed within the CONCERTO framework, energy demand is 44 percent less than national averages. 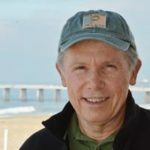 Residents were fully involved in the planning process which also led to the addition of new neighborhood facilities including a public library and elderly daycare center. As a demonstration of cutting edge sustainability features, Stadwerk Lehen features a thermal solar energy plant with a 2,000 square meter collector and a 200,000-liter tank for storing thermal energy which is connected to a local district heating system (Bahr, 2014). Over time, Salzburg plans to transform its sparsely-developed areas into urban neighborhoods that are served by greenspace and built at higher densities using renewable energy and, ideally, connected to the city’s district heating network. This infill model aims to accommodate a growing population while minimizing sprawl into the surrounding countryside, thereby protecting an alpine landscape that warrants preservation to the same extent as Salzburg’s historic center (European Green Cities, 2015). Bahr, Valerie. Ed. 2014. Energy Solutions for Smart Cities and Communities: Lessons learnt from the 58 pilot cities of the CONCERTO initiative. Stuttgart: European Union. European Green City. 2015. Salzburg Municipality, Austria. Retrieved on December 8, 2015 from http://europeangreencities.com/green-city-building/salzburg-municipality-austria. Franziskischloessl. 2015. Das Franziskischlossl. Retrieved on December 8, 2015 from http://www.franziskischloessl.at/schloessl.htm. Salzburg. 2015. Salzburg.info. Retrieved on December 7, 2015 form http://www.salzburg.info/en/. UNESCO. 2015a. Historic Centre of the City of Salzburg. Retrieved on December 7, 2015 from http://whc.unesco.org/en/list/784. UNESCO. 2015b. UNESCO World Heritage property Historic Centre of the City of Salzburg 1996. Retrieved on December 8, 2015 from http://whc.unesco.org/en/documents/101163.